A new safety test, conducted by the Insurance Institute for Highway Safety finds shocking results for the small SUV segment. See if your vehicle is on the list. Families who are looking to buy a small SUV should take notice. The small SUV segment is the fastest growing model group in the world and nearly 85 percent in the segment didn’t pass a very important safety test. The test was conducted by the Insurance Institute for Highway Safety (IIHS) and found some shocking results after all the dust and crumpled metal settled. What test di the IIHS conduct and what were their findings? The challenging small overlap front crash test conducted by the IIHS tests the safety of occupants after a small overlap front crash takes out the drivers side front fender. And what the IIHS found after they tested 13 popular small SUVs was shocking indeed. The thirteen popular small SUVs were tested through a rigid barrier test, and found problems with the front end of the vehicle crushing on impact. What does this mean for those buying a small SUV? That leads to serious intrusion inside the vehicle, which in some cases can be deadly. Only two of the SUVs tested passed the test, and only one aced the test with a good rating. The test doesn’t bode well for the fastest growing segment in the auto world. Many families are buying small SUV’s for both utility and because they get better fuel-mileage than large SUVs. But safety could an issue. Which vehicles came out on top? Only the 2014 Subaru Forester received a rating of "good." While the 2013 Mitsubishi Outlander was ranked "acceptable." The other 11 failed, with a "poor" rating in at least one category. 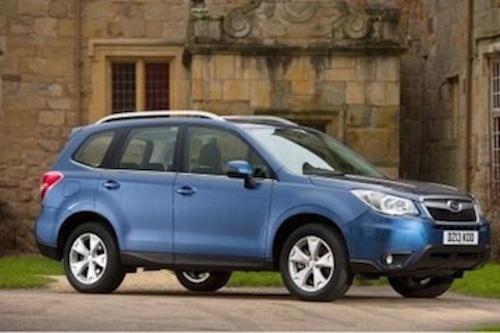 It’s no surprise that the Forester is the only small SUV to get a “good” rating because the Subaru brand has been excelling in safety for many years. The Forester is not new to high safety standards. When the Institute first started rating small SUVs for side protection in 2003, the Subaru model performed the best and was one of only two vehicles to earn good ratings. The most popular small SUV’s in the U.S. were tested by the IIHS in this overlap front crash test. The vehicles that didn’t pass the test included some very popular cars. They include the 2013 model year Toyota RAV4, Mazda CX-5, Honda CR-V, Buick Encore, Kia Sportage, Hyundai Tucson, Nissan Rogue and Jeep Patriot. The lowest ranked car was the 2013 Ford Escape. The newly designed Forester was the only small SUV that aced the test. Subaru has been testing their vehicles since the 60‘s before safety testing methods had yet to be established. The whole Subaru lineup along with the new Forester has won high praise around the globe. Families who are looking for the safest small SUV on the planet need to look at the new 2014 Subaru Forester as it continues the tradition of safety for the brand.